Since Erin first alerted me to SLS in a comment on my previous baby soap recommendation, I’ve been exploring the beauty products my family uses. I’ve been surprised how many “natural” beauty products are not natural! You can read more about my discoveries at Green Options: Green Myth-Busting: “Natural” Beauty Products. A concentrated, gentle, non-stripping cleanser. The light & fresh calming essential oil blend adds to the bathing experience. Leaves hair noticeably shiny, soft and manageable. Our customers have reported excellent results with this shampoo & body wash in their fight against eczema and other skin sensitivities. Convenient heavy-duty pump dispenses a big glob of product in one easy push. Benefits & Features: * Cleansing agent: 100% Decyl polyglucose * No Sodium Lauryl Sulfate DEA or numbing agents. * No tears non-irritating non-stripping formula. Safe and gentle. * Two products in one–use head to toe. May be used for hair face and body. * Great for babies kids or adults with chemically sensitive skin. Will not irritate eczema or cradle cap reports of healing even stubborn cases. * Effective aromatherapy. , his eczema has disappeared! There are just a few minor red patches left where the skin is healing. I am amazed and suspect that SLS was causing his skin problems. received a 2 (the super sensitive version earned a 1), compared to Johnson and Johnson’s Baby Bath earning a score of 9! No wonder my son broke out in a horrible rash when they used Johnson’s baby bath on him in the hospital after surgery. You can read more recommendations for baby products at Green Options. Skin Deep is incredible. As a person who has had over 3 decades of skin allergy problems, I wonder why none of my dermatologists has informed me of such information. Thanks for posting this. California Baby Products are expensive, but so great. I have over 10 things from there line and love them all. We kinda have to do the “a little goes a long way” thing with these, like one pump in the bath, etc. But it really is good stuff and worth every penny! I’m glad you found somethign that doesn’t irritate your son’s skin! Eczema is NO fun…I know first hand. The problem with the all natural products is the price.We try to make ours affordable and good quality. If you would like to sample, leave contact info under guestbook. A negative factor besides people not knowing the damaging effects that chemicals do is price. All natural products seems to go from some that are decently priced to the most outrageously expensive. We offer both great quality product and great price at http://www.ziranbody.com. If you would like a free sample go to our contact page and leave info. 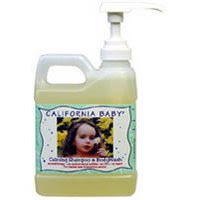 I would like to know where one might buy “California Baby products.” I currently live in Canada, but will be moving to California in one month’s time. I do not recognize this name and I do not believe I have ever seen it here in Canada. I would really appreciate knowing where I can buy it. You can always buy it online on Amazon, but they do carry it at Target and most health food stores.